Nearly 100,000 international students chose New Zealand for their studies abroad in 2012, contributing NZ $2 billion (US $1.64 billion) to the economy and supporting approximately 32,000 jobs. And, a further 3,000 students were enrolled last year in offshore programmes operated by New Zealand institutions. This makes international education a significant export sector in the country, and the government aims to see it bigger still, having set a target of doubling the sector’s value to NZ $5 billion (US $4.1 billion) by 2025. New Zealand took an important step in this direction last week with the announcement from Tertiary Education, Skills and Employment Minister Steven Joyce of an additional NZ $40 million in funding over the next four years to further the promotion of New Zealand as an international study destination. “This $40 million investment through the Government’s new Education New Zealand crown agency will continue to strengthen New Zealand education’s presence in key markets such as China, India, South-east Asia, and South America, and will attract more international students to study in New Zealand,” said Minister Joyce. The additional funding for Education New Zealand is part of a broader package of NZ $400 million in investments in internationally-oriented growth to be found in New Zealand’s 2013 budget. Beyond its immediate economic impacts, Minister Joyce also set out the role of the education sector in supporting greater economic, political, and social linkages between New Zealand and its trading partners: “Although the income from international education is important, it is the strong people-to-people links that flow from it that brings the greatest benefit to New Zealand. The new funding will be used to expand New Zealand’s recruitment efforts in both established and developing markets, encourage greater delivery of New Zealand education services abroad, and increase the participation of New Zealanders in overseas study. new safety measures are being implemented in the adventure tourism sector. This increased marketing investments follow on the heels of major initiatives from Immigration New Zealand to improve visa processing between now and 2015. These measures include the rollout of the Immigration Global Management System – a system for delivering visa services online – and the expansion of a global network of Visa Application Centres (VACs). Such moves parallel those in other major destination countries, most closely matched by recent announcements in Canada, to improve service availability and reduce processing times for temporary resident visas, including student visas. These promising funding and immigration developments are all the more important when considered against the backdrop of declining international student enrolments in New Zealand over the past decade. While industry revenues have recovered to 2003 levels over the last five years, international enrolments have been flat or declining since 2003. Education New Zealand reports a marginal increase in tuition value of 2% from 2011 to 2012, with total enrolment falling again over that same period. With the exception of ITPs (Institutes of Technology and Polytechnics) – where enrolment grew by 7.1% in 2012 – all other sectors saw enrolment declines from 2011 to 2012, ranging from a 3% drop for the schools to a 13% decline for PTEs (Private Training Establishments). The latter group is especially concerning as it is largely made up of English language schools, often a bellwether group for broader enrolment trends due to the degree to which ESL students move on to academic programmes after completing their English language studies. 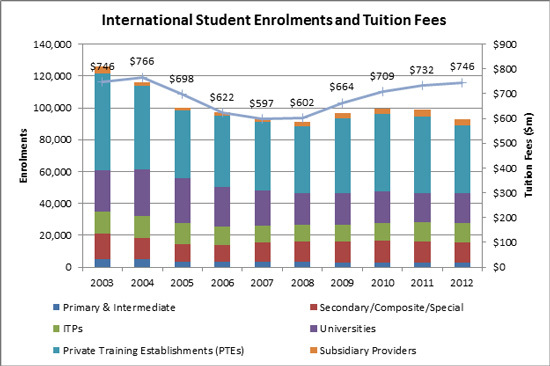 Education New Zealand attributes the 2012 drop in English language enrolments to price sensitivity related to the strengthening New Zealand dollar, intense competition in the ESL sector, and changes to immigration policy impacting ESL students. The Education New Zealand analysis is accompanied by the crown agency’s strong commitment to “working with each sector of New Zealand’s international education industry to support institutions’ needs and priorities, and to enable industry-led growth” – a challenge for which the country’s increased marketing investment and visa system improvements are surely very welcome developments indeed. This entry was posted in Australia/Oceania, Higher Education, Immigration, K-12, Language Learning, New Zealand, Regions, Vocational and tagged higher education statistics, tertiary education overseas, language learning, vocational education, tuition fees for international students.